Mackenzie Condon out at the high school; she heads to the state finals for the long jump. Mackenzie Condon is going to the all-state high school track meet to compete against the best of the best track athletes from across Massachusetts. But the route she took to earn her way there wasn’t exactly how she planned it. 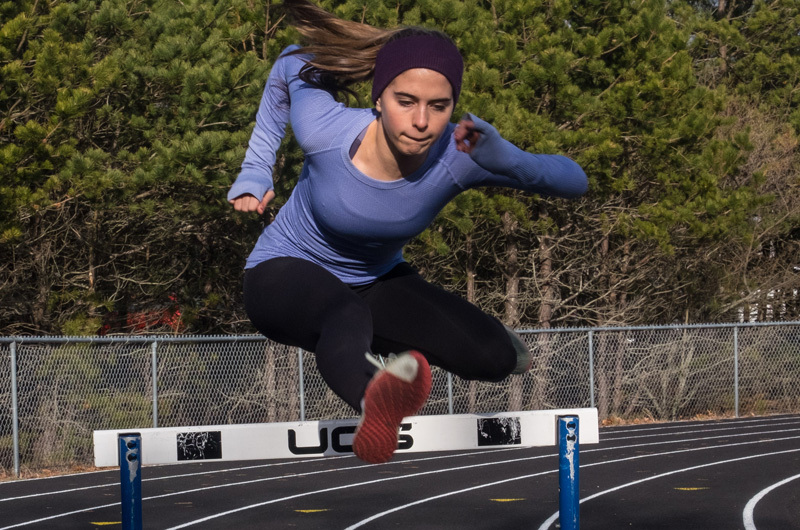 Consistently ranked among the top hurdlers in Division 5, she expected to qualify for the all-state meet on Feb. 15, when she competed in the 55-meter indoor hurdles at Reggie Lewis Arena in Boston. In the preliminary heat that day, she crossed the line first, qualifying for the finals as the top seed. In the blocks for the finals, she had a whole winter of training and a whole lot of hopes and dreams on the line. “I had a good start, not a great start, but a good start,” Mackenzie said. She was competing against her arch rival, Alexandra Gonet of Pope Francis High School in Chicopee. Sometimes it takes a long time to get over the crushing, draining disappointment of a loss like this. But sometimes, fewer than three minutes after tumbling to the track and losing all hope of qualifying in your best event, you hear your name called out through the relative chaos of the division final meet, and you realize you are due on the runway of the long jump event on the other side of the arena. Following the preliminary jumps, she was sixth among her competitors. Going into the final series of three jumps, she was feeling the strain. Only the top three would qualify for the all-state meet coming up Feb. 24. It came down to one last jump. Down the runway, into the air, and hit the sand. She jumped farther than she had ever jumped before, 16 feet 4 inches, and moved up to second place, more than enough to qualify for the all-state meet. It was four inches better than her previous personal best, a giant accomplishment in the long jump event. Like most schools in the state, the Island’s regional high school does not have indoor track facilities. It takes extra creativity to compete in the winter. It means utilizing hallways and weight rooms, and squeezing in indoor work on the weekends when the basketball teams are not using the gym. “The kids have to show a lot of commitment,” said Coach Schroeder. Commitment has never been a problem for Mackenzie. She began running, and winning her age group, in road races when she was in elementary school. 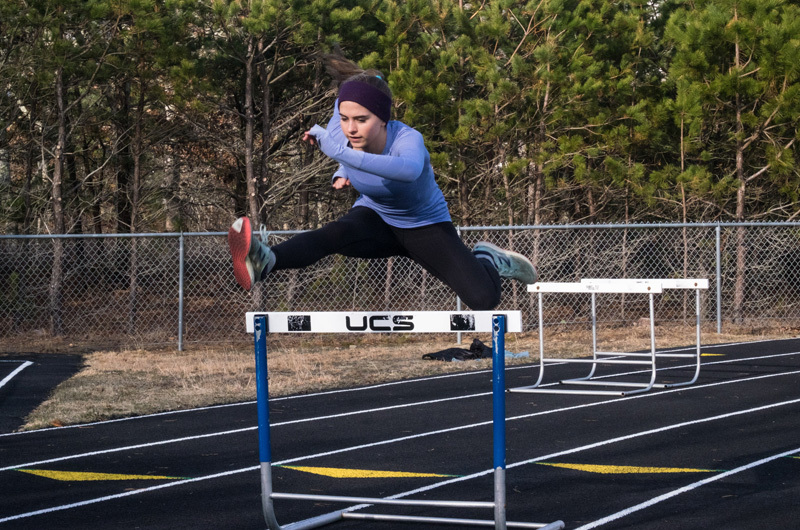 In high school she channelled that speed into shorter distances, and eventually found her calling in hurdles events, the 55 meter hurdles during the indoor season, and the 100 and 400 meter hurdles outdoors in the spring. This year she has broadened her focus to the pentathalon, a competition that combines the high jump, long jump, 55 meter hurdles, 800 meter run, and the shotput. She has also qualified for the all-state meet in the pentathalon. Still in her junior year, Mackenzie has already attracted the attention of several college track coaches. Gotta get back up. Life lessons are always being taught in track and field. It’s the nature of the sport.